What could be a better vacation idea than hanging out on the sunny beaches of some Caribbean country? With family, friends or just that one special person, you can have a great time in Puerto Rico for instance. 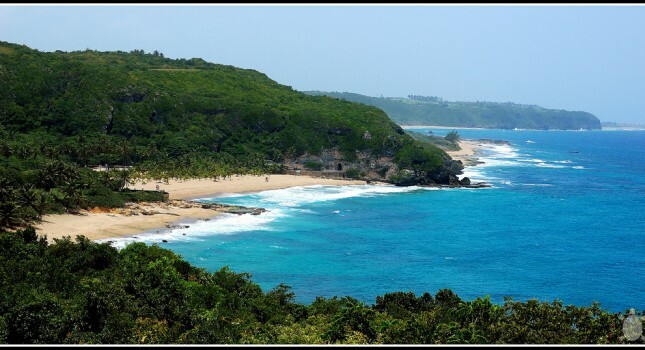 Now you will only have to find a good hotel deal because we have brought you some Cheap flights to Aguadilla from major cities in North America. 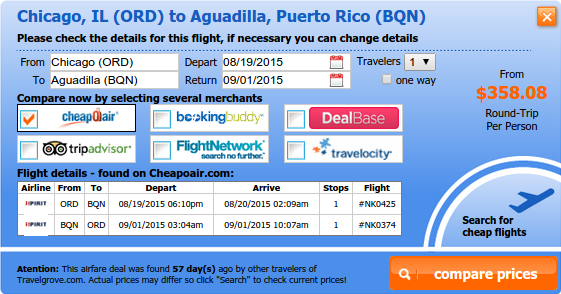 The cheapest flight we have found to Aguadilla is departs from New York City. It flies out of John F. Kennedy International Airport (JFK) on September 17 2015 and will return from Rafael Hernandez Airport (BQN) on September 26. This flight to the Puerto Rican city is non stop. If you plan to travel off season, or more precisely shoulder season, we have found you a great flight for November 2015. It flies out of Newark Liberty International Airport (EWR) on November 14 and gets back from BQN Airport on November 22. Note that is is non-stop both ways. 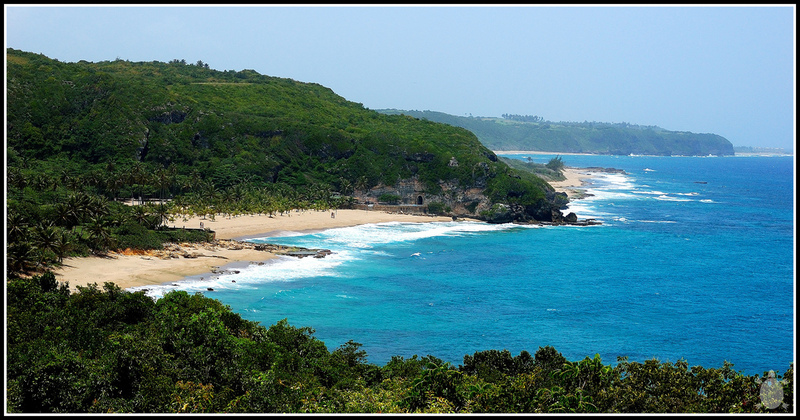 If you are a resident of Chicago, you can fly to Aguadilla for $358 r/t with Spirit Airlines. It starts out of O’Hare International Airport (ORD) on August 19 and flies back on September 1 from the Puerto Rican city. This time you will have one stop each way! 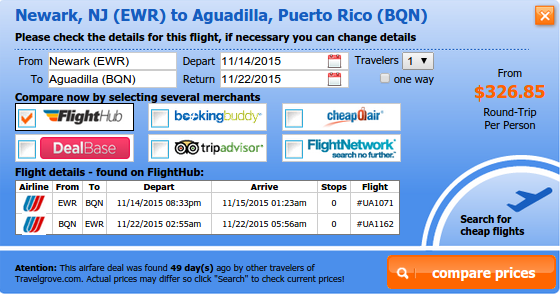 The Denver to Aguadilla airfare we have found costs $404 r/t and is operated by United Airlines. The departing flight starts out of Denver International Airport (DEN) on November 4 and has one stop. The return flight is on November 11 and has got two stops. Our next offer is a last minute flight from Orlando with jetBlue Airways. It departs on June 13 from Orlando International Airport (MCO) and returns on June 22. This flight is non stop and costs $408 round trip. You live on the West Coast? 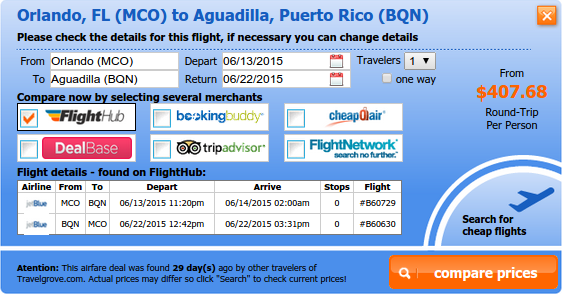 Fly from San Francisco to Aguadilla for $483 r/t. This jetBlue Airways flight takes off in San Francisco International Airport (SFO) on August 26 and returns from Aguadilla Airport on September 9 2015. The departing flight has two while the return flight only one stop. You can check the Aguadilla airfares from above for yourself by selecting some providers and comparing their prices. make sure you are booking the best flight offer and you may find even cheaper fares than we did. This entry was posted on Tuesday, July 10th, 2012 at 8:37 am and is filed under Airfare Deals. You can follow any responses to this entry through the RSS 2.0 feed. You can leave a response, or trackback from your own site. I understand the Spirit airline deals expired, but I cannot find a good deal in the table with other flight deals. 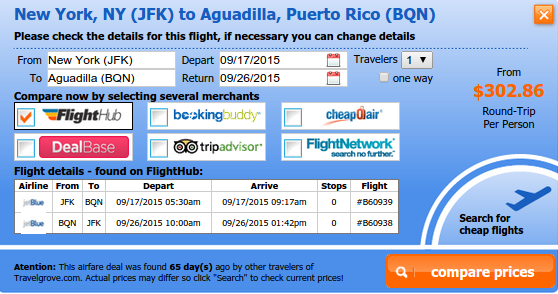 How can I find cheap flight deals to Puerto Rico? Sorry, my Spanish is not that good so I’ll respond in English. To run a search for Newark-Minnesota just go to the main page, enter your search details and select providers you prefer – remember, the more the better. What is your exact destination in Minnesota? I just ran a search for EWR-MSP for your dates and the best price I could find was $543. Also keep in mind that weekdays (Monday-Thursday) are the cheapest and also consider nearby airports. For example flying on 06/24-06/26 between LGA-MSP will cost you only $422. adicional tiquetes para el dia 25 de octubre de Orlando a Miami para las mismas personas. I just run a search with your details on major providers – the best price I could found was $795 per person with American Airlines. I found this rate on TripAdvisor; so the total would be $2,384.85 USD. Cheers and have a great trip! Ante todo, perdona me pero mi Espanol no es mui bueno. Acabo de realizar una búsqueda con tus datos en los principales proveedores – el mejor precio que pudimos encontrado fue de $ 795 por persona con American Airlines. Encontré esta tasa en TripAdvisor, así que el total sería de $ 2,384.85 USD. Saludos y que tenga un buen viaje! Perdoname pero mi Espanol no es mui bueno, dame las fechas de viaje de Usted con la ciudad de salida y de destino. Voy a realizar una busqueda con ellos en Metafares.